Shame. It was the sensation creeping into the pit of my stomach as we made our fourth trip to the counter at Cinderella Bakery & Cafe. But embarrassment was edged out by all the piroshkis that had taken up residence in there. At this point, we weren’t motivated by hunger. It was something much more powerful – desire. Cinderella Bakery & Cafe has a storied past. Established in 1953, it claims to be the oldest authentic, homestyle Russian bakery in the Bay Area. Every day fresh baked breads, cookies, cakes and croissants as well as traditional dishes like Borscht, Beef Stroganoff and Piroshki are served out of its small storefront on Balboa Street in the Richmond District. Many of the newer bakeries feel like a museum with their minimalist appeal and meticulously placed goods. Cinderella feels more like visiting your Russian grandma with its displays overflowing with savory and sweet baked treats. My eyes scanned the large glass cases that flanked the cash register. I was mesmerized by the shortbread cookies with glistening jam centers the rows of piroshki with their bloated pastry and the towering pieces of cake. But if you come to Cinderella Bakery & Cafe you have to try the piroshki. So, we tried three. We had two fried variations – the beef and cheddar and the beef and gorgonzola – and then a baked piroshki with potato, mushroom and onion. I may have felt healthier for having the baked piroshki, but I felt happier when eating the fried. The delicate pastry ensconced the hearty beef and cheese filling. It was a perfect juxtaposition of textures and flavors. Not one to play favorites, we also gave the sweet side of the house its due attention trying a checkered cookie with sesame seeds, a hazelnut macaroon and the honey cake. With its dense cake and sweet honey icing, the Russian honey cake was unabashedly decadent and was a crowd pleaser for this party of two. Over the course of lunch and dinner, we managed to try nine different dishes. I wasn’t proud (well sort of), but I was satiated. What I was pleased with was the price tag for this gluttonous adventure, which hovered around $30. 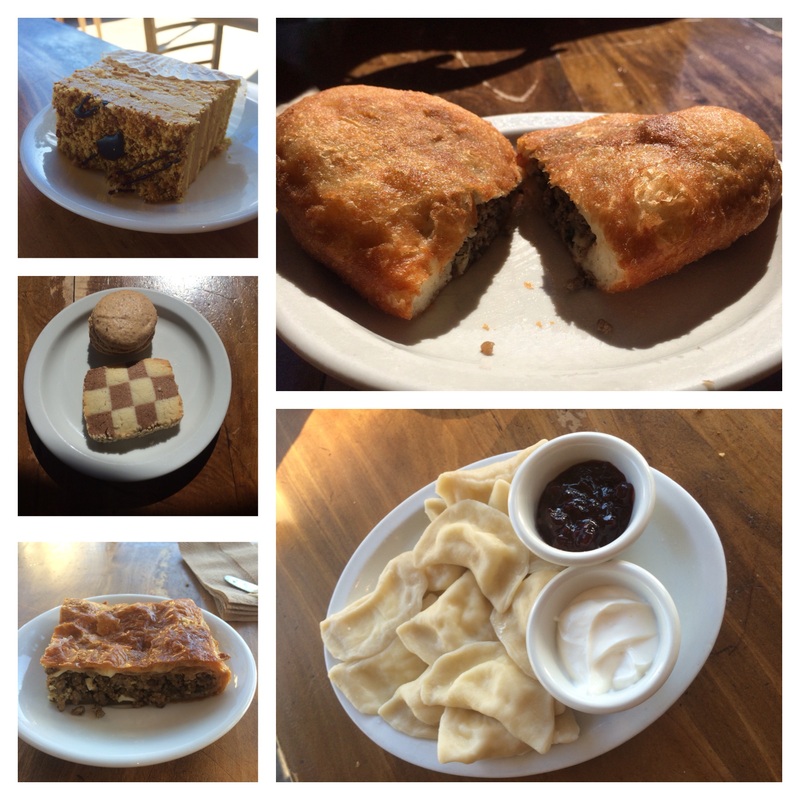 Tip: Don’t miss the spinach croissant, Siberian pie and the fried beef and gorgonzola piroshki.